Ques: What is page life cycle in asp .Net? Ques: Describe events used in complete asp .net page life cycle. Ques: Define Init, Load, Render and Unload events in page life cycle. Today I want to share some knowledge about ASP .Net. Every developer who is working on ASP .Net must know about the Page life cycle[first step of web development using .Net technology]. Some of our friends after having 2-3 years of ASP .Net experience still don't have proper knowledge about all the events used in Page Life Cycle . As a developer I always got confused about page life cycle events in my beginning days, Here I am describing all the events with examples wherever applicable. In above you can see I’ve used a master page dynamically and set a label and TextBox’s Text property of that master page in runtime that means we can set the master page dynamically and associate the values in their controls if any. If you try to set the masterpage in any other event after Page_PreInit event, you will get an error message that will tell you that the master page only can be set on or before Page_PreInit event. In Page_PreInit event you can also see at the top level I’m checking a TextBox1 value whether it’s null or not. It is a server control (TextBox), but in PreInit the value will always be null of this text box or any other server control. So if I want to conclude the thing, in Page_PreInit controls are not fully initialized. So use this event for setting MasterPage file in your code. Each control Unique ID’s are also available at this event. Init is called when you can initialize your page controls, this is the place that comes into picture after each Control initialization, till this event they get their Unique Id, master page etc. In Init you cannot access any controls properties after the last viewstate, I mean suppose you enter some text in a textbox control and click on a button control that makes a postback, now you want to view the value latest entered. In such case you will be able to see the textbox value which you’ve entered after the round trip happens, this is because of ViewState property of controls. That means they preserved your last saved value, but you see this value after Init phase because, usually we don’t use these events in our code and use just Page_Load event where the Viewstate value already got loaded. But as in Init phase, we cannot access our latest entered values in textbox, so in Init you won’t be able to get the latest changes. So I can say in Init we won’t be able to get the postback value. In this event, Viewstate functionality is turned on for server control. Viewstate of controls allows preserving their values across postback. 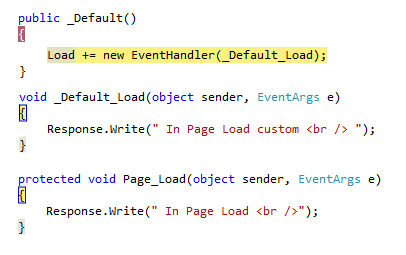 As you are seeing in above code, I’ve created my own Page_Load event in my code behind as well as the default Load event, I didn’t mention Page_PreLoad event here, but it will execute after Page_InitComplete event. So back to the image, the _Default_Load will execute first before the Page_Load event. If you have any master page in your page, then the Load event of your master page will run followed by the user control Load event if they exist in your file. After the Page_load the next event is Page Control’s event. For example, if you have a control that raises postback just like button, and you clicked on the Button, so after Page_Load your Button_Click event will fire, and do the rest of the thing you’ve mentioned in your page. for better understanding please refer to the image below, event execution will be happen in that sequence how image is showing, in event portion whatever you will do that will go ahead and will do the things you’ve mentioned in you page. 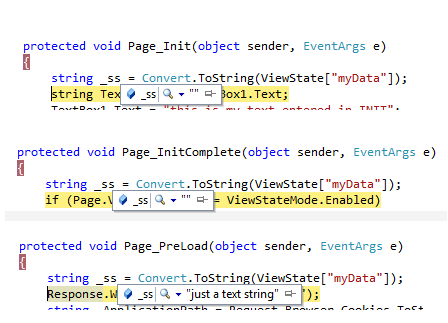 just like below, I said to create a ViewState[“myData”] and put some string inside that viewstate. So now the viewstate is ready to preserve ahead in my code. In Events you can also check the Page.IsValid property if you’ve used any validator controls in your page like regularexpressionValidator, requiredFieldValidator, Range etc. To check this property refer to the image below. This event can be used when all the event processing has been done in the page. PreRender event gets called when page has created all the controls that user will see in his browser. PreRenderComplete is the last place to change anything in the page. After this event any changes will not get preserved in page cycle. event gets fired immediately after the PreRenderComplete event, in this event the viewstate functionality and control state get saved, as I said in PreRenderComplete changes can be done that will affect the next postback. In SaveStateComplete you can do the changes in your server control, but the state won’t be available in next postbacks. As you can see in the code above, I’ve override the Render method in my code and write something with Heading 1 tag and later on called the base.render method. In current scenario the thing will happen is: apart my server controls code in my browser I’ll be able to see my Hello world text also. If I remove the base.render method calls, than I won’t be able to view my any control if I’ve created in page. This is the last event that gets fired. This is the page cleaning process like closing the open file connections etc, so in this process you cannot do any kind of manipulation with data that affect the rendering, you are restricted to use Response property also, and doing such you will get an exception message. There might be some mistakes with this article but I tried my best to share with you, So if you have some queries OR suggestions please feel free and share the by comment. Thank you for reading this post.. This is the best tutorial on ASP.Net Page Life Cycle I have ever read. Explaination with example way is very nice.Very helpful in understanding. After long time I could understand page life cycle. Thanks.. Impressed by reading this article. what are the events are raised when button click ????? Dear, I think you got your answer. But I think ViewState["myData"] value get on Page_Load event instead of Page_PreLoad Event.